What are the meanings of red tulips? If you know how the red rose has al those symbolic meanings, then you should know that red tulips have the same number of meanings, and if you are interested to learn more about this read the article below. 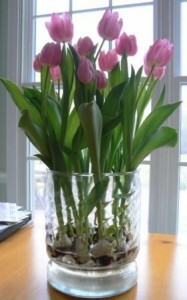 Tulips are flowers known for their beauty and colors. Their origins come from Persia and Turkey and then they were brought in Europe during the 16th century. Many flowers have symbolisms in the entire world and the same thing applies to red tulips. 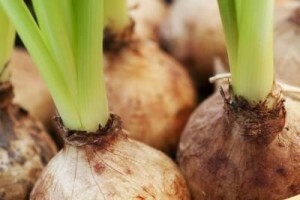 As tulips come in many different colors, each color has its own symbolism. For instance white tulips symbolize purity and innocence, the purple tulip is royalty or the yellow tulip that symbolizes cheerfulness and radiance. Still the red tulip represents one of the most representative type. Because of the color red, the tulips are associated with a feeling of love. If you didn’t know, the association with love comes from an old legend. This legend states that a young man called Farhad that falls in love with a beautiful girl named Shirin, but until he can express his love feelings the young girl dies. Because of the pain, he killed himself, but in the place where his blood poured red tulips grew out of the ground. This is why eternal and true love are symbolized by red tulips. The red tulip also has symbolism in Feng Shui. 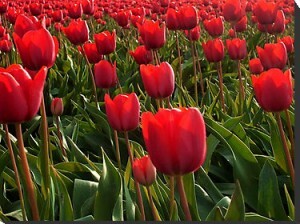 It is said that if a person has red tulips around the house he will become famous or fame will come to him faster. They are also thought to bring wealth along with love. Because of their beauty and symbolism, red tulips are often used as tattoos by girls. We can say in the end that there is not a big difference between the meaning of red roses and red tulips. Love is what unites them. Think about this next time you want to give someone a gift of love.